Maxwell’s Mega Mission is the first book written by Jayne Baldwin for the seven to nine year age group but the chapters are the ideal length to read to younger children as a bed time story. Maxwell thinks his family is boring and his Dad is particularly dull. He longs for excitement and adventure and when Dad finally takes him on a mission for Mum he thinks life will change. They have a narrow escape from Professor Whiskerton, the cat, but Maxwell soon forgets about the dangers and only remembers the amazing smell he came across. When everything goes back to normal Maxwell decides to go on an adventure of his own to discover the source of the fabulous smell. He thinks he’s found a thrilling, amazing heart racing ride but when he confides in his sister Morag she thinks something doesn’t sound quite right. When Maxwell goes missing Morag has to tell Dad about their secret and she finds herself on a mission of her own – to rescue her brother. But will they find Maxwell before it’s too late? 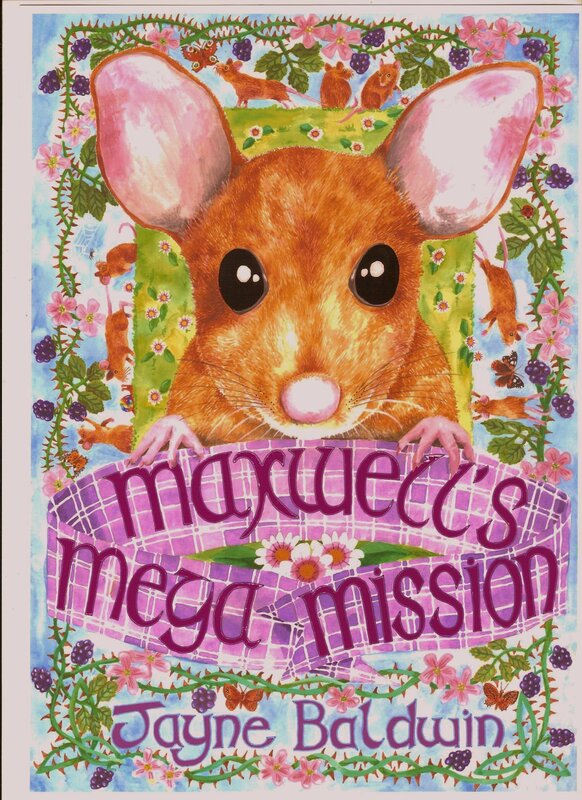 Cover of Maxwell’s Mega Mission. This 148 page book features beautiful pen and ink illustrations by Shalla Gray at the start of every chapter.